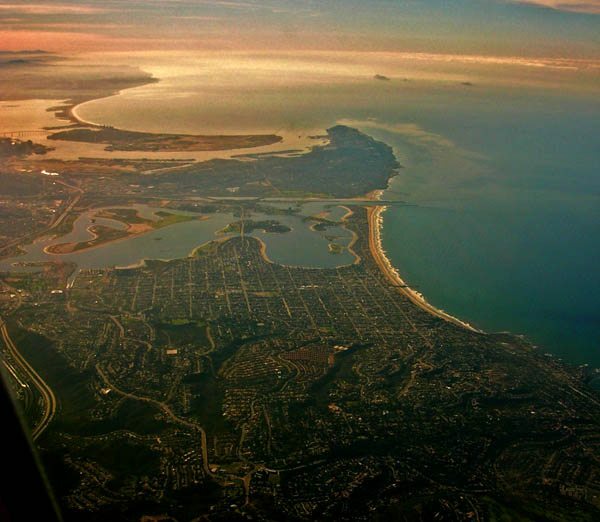 This is over La Jolla looking south at Mission Bay and San Diego Bay. Photo: Kurt. I love searching the ocean for fish and other good things to eat. But the ocean has been changing, and so have I. My addiction began on a day when the surf at Windansea was, at best, knee high. I swam from Windansea to Bird Rock, gawking at halibut, lobsters, abalone, moray eels, starfish, urchins, garibaldi, schools of sargo, barracuda, opal eye, and bait fish. From that first day, some 30 years ago, I was hooked. I grabbed abalone and lobsters, pole-speared perch, calico bass, sheephead, and halibut, then started using a speargun for yellowtail and white seabass. Diving in a kelp forest on a clear day is magic. The twisting strands of kelp form columns stretching 30 or 40 feet or more into a blurred, sunlit canopy at the surface. Lungs filled with salt air, diving, swimming through an ancient, submerged cathedral; an underwater redwood forest. You never know what you’ll find: maybe white seabass, sunfish, a turtle, or giant black seabass. Anyone who dives or fishes knows how fragile the ocean is and how long it takes to recover. Almost overnight, the abalone disappeared. It takes an abalone at least 10 years to grow to legal size. The big lobsters I used to catch were probably 20 years old, and they were 10 times more fertile than the youngsters. The proposed network will preserve critical habitat at South La Jolla (including the Bird Rock area) and Swami’s Reef, leaving nearly 90 percent of coastal waters open to fishing and harvesting. We’ve heard dire warnings about the economic impacts of the proposed network, but Department of Fish and Game statistics indicate that the proposed network will actually have less of a financial impact on the San Diego lobster-fishing industry than the network originally proposed by the commercial fishing industry. Along the central coast, where the new protected areas were implemented in 2007, the fishing industry and the environment are both doing fine. Protecting the ocean protects our economy. A recent survey showed “non-consumptive” ocean users spend $115 million a year in Southern California, compared with $26 million spent by “consumptive” users. Our ocean is a beautiful and terribly delicate gift. I don’t want to be the generation that destroys it, leaving nothing for the future. I hope Fish and Game will respect the hard-won compromise the Integrated Preferred Alternative represents when they meet on Dec. 9; and I hope when they reach a decision next year, they’ll vote to adopt and implement the marine-protected-area network it proposes. It’s our last best hope. Mike Laude is a retired software engineer and recreational spear fisherman. He now lives in Ocean Beach. This author is right- our ocean is an awe inspiring, incredible, yet fragile place. For years we have taken this gift for granted hurting more than helping the marine ecosystems that we depend on to swim, surf, fish, and enjoy. Luckily, it’s not too late to change course now. By supporting the MLPA and the Integrated Preferred Alternative we have a real chance to not only protect our ocean ecosystems for future generations, but also to help them recover in our own lifetime to a level of health not seen in years.